This September has been a difficult month for me, at work and in my personal life. Having it all come [almost] at the same time has knocked me off my center. And I’ve had to remind myself [repeatedly] that I have solved more intricate and overwhelming challenges. We will make it through these too. I’ve had so much spin in my head that it has made the most simple things complicated. Like today. Today is my youngest child’s 16th birthday and we went to the Department of Motor Vehicles so he could get his driver’s license. We went three times before we actually got there with all the documents that were required for him to take the driving test. And the employees there were all so stressed that they were snarky and snapped at other patrons, and at me when I asked for my insurance card back. Whew! 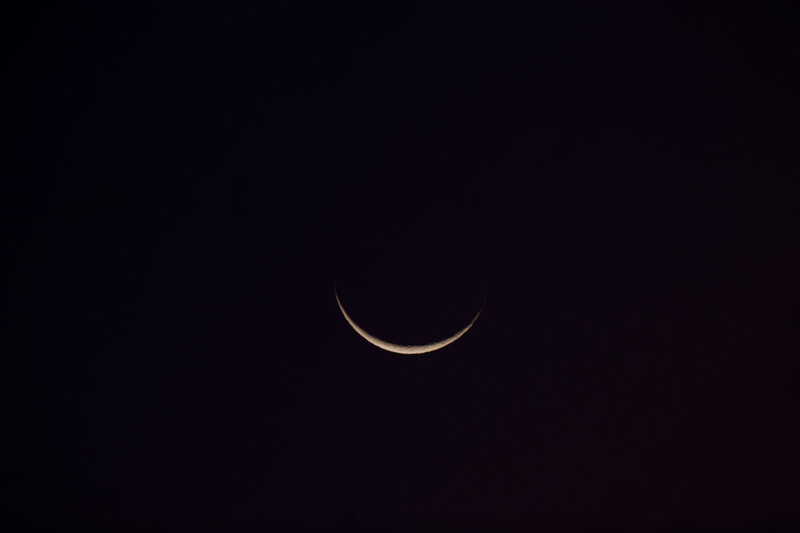 Tonight, as I drove back from taking youngest son to his dad’s house, there hung on the horizon a sliver of a moon over some trees just beginning to turn. And I found my center. We are here to celebrate the beauty we experience, to help our fellow travelers and grow in maturity and ability to love. Reader Erin asks if minimalism would help while trying to go to nursing school while raising toddlers. As you already know, minimalism helps everything. When I was in nursing school, I had only one child and I lived in a town far away from family. So I did not have the usual resource of relatives to help. Even my son’s father lived in a different town. We rented a studio apartment near campus. We shared a fold-out couch for the first couple years, and later someone gave us a toddler bed. There was a table and three chairs, so we could even have company for dinner. The space was small, so it didn’t take much time to clean it. I had a set of four plate and bowls, so it was impossible for the kitchen to overrun with dirty dishes. My son had eight outfits, and I did the laundry at a laundry-mat weekly. I had two pair of jeans, a week’s worth of tops and the all-white student nursing outfit. The first two years, we didn’t have a car and we walked where we needed to go. I had a red Radio Flyer wagon that transported groceries and laundry. I typed papers on free typewriters available at the school. I was able to get work on campus, both as an English tutor and as a model for the art department, so I scheduled work in between classes. Any free time during the day, I studied. I took my son to day-care in the morning, walked to school/work, picked him up around 5pm and then we would have dinner and play and read books. After my son went to sleep, I would study for 2-3 hours before going to bed. I didn’t date, I only went shopping when we needed something and my entire focus was on providing the things my son needed and school. I had a friend with a son abut the same age as mine, and once a month or so, we would go to Chuck E. Cheese and nurse a beer for a couple hours while the boys played. It was tough at times, but it has allowed the rich and abundant life I now enjoy…so very much worth it. 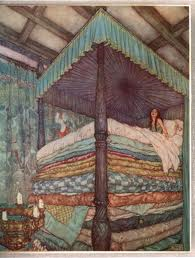 Do you remember the story of the Princess and the Pea, in which a skeptical potential mother-in-law tests the nobility of a young girl by putting a pea under about 20 mattresses? The older woman is convinced of the young woman’s noble birth by the bruises she acquires while asleep. Life is going to send us all kinds of challenges. Unexpected physical demands, unforeseen money surprises, annoying people. Rather than letting these events throw us into a swoon or worse, a panic, let us plan for future challenges by training ourselves to be frugal and strong and kind now. Then when those difficult situations occur, we are prepared. No matter where you are now, take steps to improve your health and finances and relationships. No flopping on the bed and moaning, “It’s too haaarrrd.” “I’m too buuussyyyy.” “People are meeaan.” Wah! It is hard, you are busy, people can be mean. Don’t be distracted. I think of it as interval training. When training to build muscle, you push your body really hard for a short period, exhausting it. Then you let it rest. Then you go all-out again. This work hard-rest cycle builds strong bodies. Using a work hard-rest cycle can build emotional and financial strength as well. On my recent trip to Minnesota to drive my daughter and her stuff to college, I got a chance to visit with two different persons that know about my counting game of keeping personal possessions to less than 100 items. 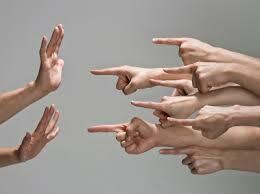 Both of them, on different days, in a guilty tone, confessed that they had too much stuff. As if I were a supermodel and they felt bad for eating that balanced meal of grilled chicken, steamed broccoli and rice pilaf in front of me. The thing is, each of them was in a different phase of life, but one prone to accumulation. One had just helped her parents clear out the family farmhouse (so, not just 50 years of stuff, but 150 years of family heirlooms) and the other has recently welcomed an infant to the family. The farmhouse clearer is overwhelmed by the stuff that she took into her own home, as she rescued it from de-clutter of her parents home. She is too busy to deal with it now, but we talked about strategies to share the family stuff when she does have time to deal with it. Tellingly, she is motivated to do so sooner, rather than later, as she doesn’t want her kids to have to deal with what she did. The new mother, on the other hand, is an expert de-clutterer, having previous experience and lots of resources at hand to move items through their home when they are no longer needed. She doesn’t need my help at all. When the time is right, she’ll be able to de-clutter again. There is an ebb and flow to life. No point in wishing to be at a different point of the cycle.